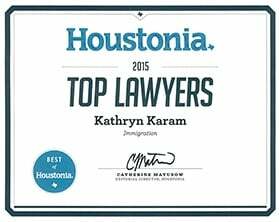 Kathryn N. Karam | Texas Immigration Lawyer at The Law Office of Kathryn N. Karam, P.C. 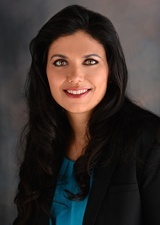 Kathryn N. Karam has exclusively practiced immigration law since November 2007. She is Board Certified in Immigration and Nationality Law by the Texas Board of Legal Specialization. Board Certification is given by the Texas Board of Legal Specialization to attorneys that demonstrate the highest public commitment to excellence in their area of law. Less than 10% of licensed Texas attorneys are Board Certified. Attorney Karam began her career at Quan, Burdette, and Perez, P.C., which later became FosterQuan LLP, in Houston, Texas. During this time, she handled all types of immigration matters, including family-based immigration matters, naturalization and citizenship issues, employment-based matters, non-immigrant visas, and detention and removal cases. Attorney Karam was later employed with Greenberg Traurig, LLP in Houston, Texas, where she primarily handled non-immigrant visa matters. Prior to attending the University of Texas School of Law, Attorney Karam studied Chinese, earning her Bachelor of Arts in Chinese from Trinity University in San Antonio, Texas, and then earning her certificate in Chinese studies from the Johns Hopkins-Nanjing University Center for Chinese and American Studies.